The victim was walking along this stretch of road when the assault took place. Police are now appealing for witnesses following the incident in Sowerby Bridge in the early hours of Friday morning. Between 1 and 2am, the victim, a 22-year-old woman, was walking on Wharf Street towards the junction with Wakefield Road when she was approached by two males, who sexually assaulted her. One of the males is described as bald, in his mid-30s and of slim build and West Yorkshire Police say the victim was wearing a yellow, waist-length puffer jacket. Detectives are now appealing for anyone who witnessed the incident or has information to contact police. Sgt Ross Wadsworth, of Calderdale CID, said: “The victim was wearing a distinctive jacket and we hope by releasing this detail it may jog someone’s memory and someone may have seen this incident unfold or the moments prior to the incident. 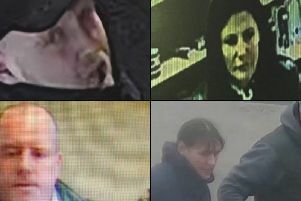 Anyone with information is asked to contact police on 101 or via the online live chat service on the West Yorkshire Police, quoting crime reference 13180537587. Information can also be passed anonymously to independent charity on 0800 555 111.